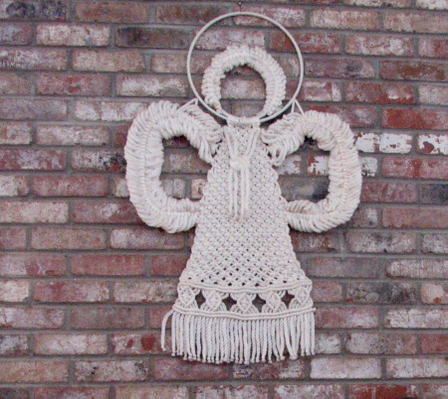 Large macrame angel above Sara's mantel. My friend Sara invited our Tuesday Spanish group to her home for lunch--and to see her huge collection of angels and creches. She--with the help of her family and friends--has been collecting seriously for 39 years. She still has her first two angels that were given to her when she was around 9 years old. I have seen the angels and nativity scenes that appear in stores and houses around Christmas time every year but I have never seen such artistry and diversity together in one place. She has traditional angels and nail-haired metal modern angels; angels made from charred wood from the Hayman fire of a few years ago which took lives and destroyed much property, forest land and habitat. One angel is made totally of Mississippi mud. A new nativity scene, brought to her this Christmas from Africa by her son, is totally carved from one piece of ebony wood. 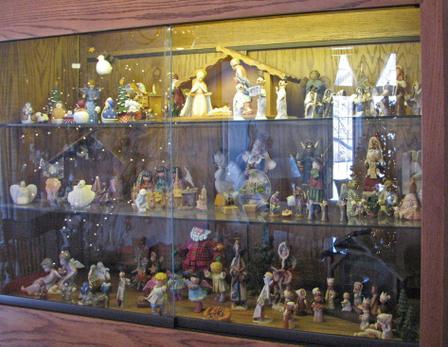 She has angels and nativities from many countries, carved and shaped in both classic and folkloric styles. 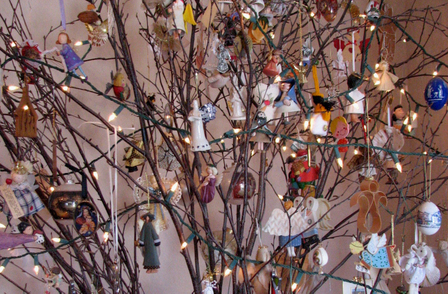 In a corner of her dining room year round sits her "angel" tree with just a few small ornament-sized nativities mixed in. When asked how large her collection is, she says, " I have around 70 creches but I have no time to count the angels." We estimated from just the ones we saw on the main floor that it is surely in the hundreds. We began speaking Spanish but after exclaiming "Muchos Angeles!" several times and asking how one says Nativity Scene in Spanish, we retreated to English and our many questions about her most impressive collection. 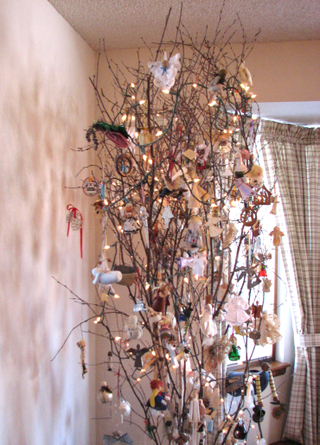 A more-detailed view of the angel tree. One of several cases protecting the most fragile of the creches. Sorry the quality of the photo but it was hard to maneuver with furniture and window reflection on the glass. Hopefully you can get the general idea. Add a delicious lunch prepared by Sara to the lovely art and in total it was a most enjoyable day. "I have always been interested in megaliths, stone circles, labyrinths and rocks in general. I started mountain climbing in 1957 and also have done a lot of caving--which means that I've spent a lot of time on top of and inside rock. When I heard there was somebody making rocks, I went out to watch him do it. Later we became friends and he showed me how to do it. 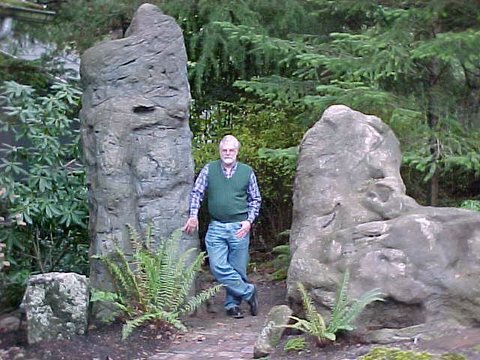 My first project was this gateway to the back yard: Old Man Rock and Old Woman Rock." "The second photo shows the two rocks on the North Umpqua River that the two fake rocks represent. I was in the first ascent party on both of the real ones." 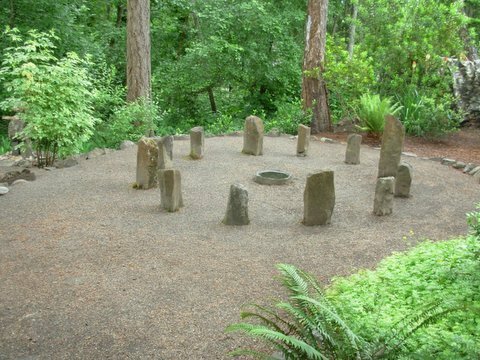 "When I started working the back yard the second project was the Brae Burn Stone Circle (real rocks) which shows both the winter and summer solstice. I had to make a level spot which meant a lot of digging and also a retaining wall on the low side to bring it up. I used little sea shells for a while to mark the solstice spots, but kept finding them in the water basin where the raccoons tried to wash them." 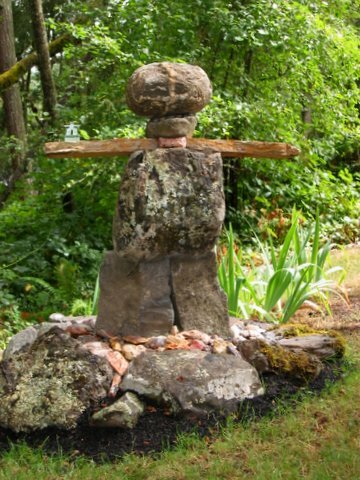 "The next project was the "Inuksuk" because I liked the idea--and I had the rocks." "Next I built the Inca Wall Labyrinth last year. It's called that because the curved wall is carved like Inca Stonework. 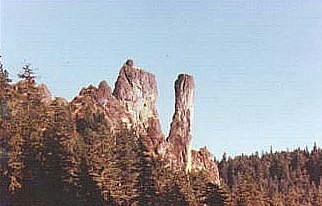 The famous 12-cornered stone is in the center. 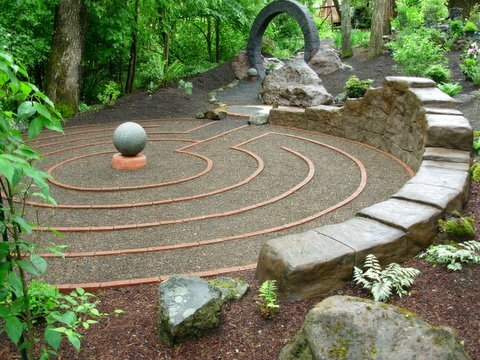 The labyrinth is a simple one due to space limitations." 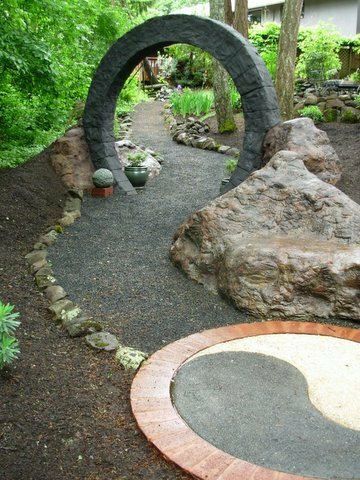 "The Yin-Yang entrance circle was built to join the three paths and also because it is a circle. I call the back yard a "Garden of Circles." I did this during February hoping I would be chosen for the Eugene Symphony Guild Garden Tour. Then I found out that I was. Panic! 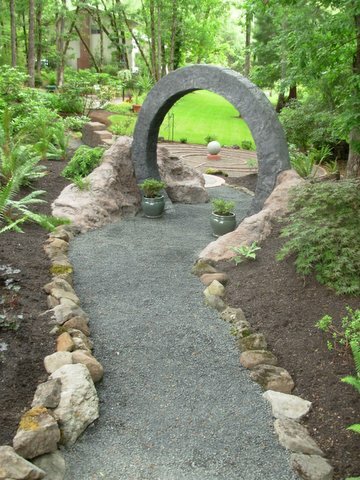 I needed to get going on the Celtic Star gate to complete the grand plan." "About three years ago Lee and I were on the deck and were wondering what we should do with the back yard. (We had just bought an additional 20 feet back which really opened things up.) She said, 'Why not a Star gate?' It took me all these years to come up with a good design--and a safe way to build it. A circle of cut stones would not support itself, so I came up with the idea that were two big rocks and the 'gate' was built between them. I am pleased with the way it turned out. I finished it about two weeks before the tour and then brought down 7 1/2 yards of dirt in my wheelbarrow to fill in around and make it look logical then threw plants at the empty spaces." I am so pleased that Gary allowed me to feature his beautiful photos of his spectacular garden and tell the story of its development on my blog. Thanks Gary! Two days ago our house-guest of four months left to return to Argentina with a five-day stop in Miami to visit friends. 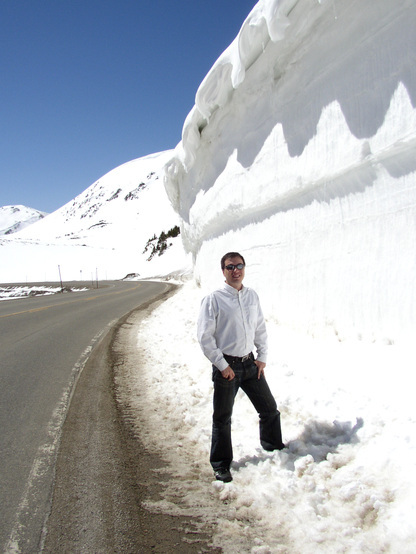 The last week we did a whirlwind tour of Denver and nearby mountain areas to take photos of some of his favorite places. He had seen snow but never "lived" with it. Arriving in two days before Christmas and leaving the end of April he got a good taste of Winter and Spring. He was here on a special work-experience and travel program. His Visa allowed him to work four months and travel one month before returning home. Though he is totally fluent in English and has completed his university studies in accounting--except for the four final exams he must take when he returns--the work he did here was menial work for a terrible company that exploits the workers. There are good work-travel experiences but the one he was on was not one of them. We shall miss him a lot but he and his parents have invited us to visit Argentina so I am sure we will meet again. Through Santiago we met other Argentinians here on the same program (pictured below with us in our home). Each time we host an international guest, I am reminded of Mark Twain's quotation, "Travel is fatal to bigotry, intolerance and narrow-mindedness." It applies to both the visitors and the visited. Last night during an insomnia break I began reading blogs to return me to a sleepy state. I figured that the Science Blog might just do it. I'm just kidding; I love the Science Blog. While reading an article on Chronic Pain Management, I learned bits of information like: Women have, on the average, about twice as many nerve receptors which cause them to feel pain more intensely than men. "According to the National Retail Foundation, the most popular Halloween costume last year was Spiderman. Next was 'a princess,' followed by witches, vampires, SpongeBob, Barbie and Harry Potter. Sounds about right. But if you read the complete list of top costumes, you'll notice something missing: astronomers. There are no Sagans, no Galileos, not even a Hubble. And that's funny, because Halloween is an astronomical holiday. Click to read the entire article. When we returned from Chile we deplaned and hit the ground running. My son called me in Santiago to say my mom was in the hospital with severe pneumonia. When I called my dad he insisted that she was in good hands and not to come back from our trip four days early. Though I spoke to her every one of those four days, I still wanted to see her as soon as possible. Without even unpacking we threw our luggage into our car and drove 12 hours to the small New Mexico town where my parents live. 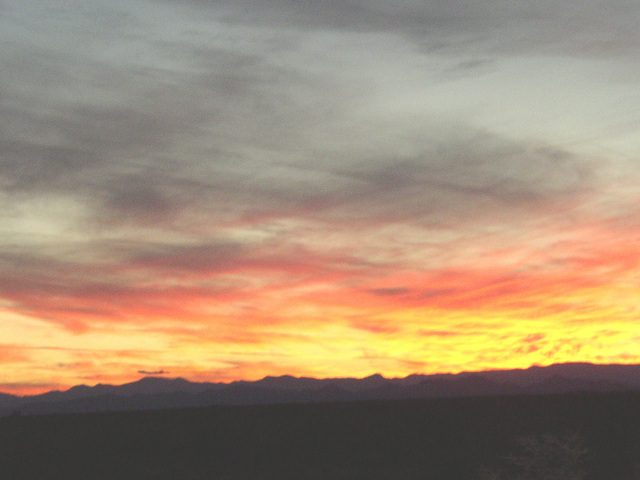 Just 8 miles out of Truth or Consequences, New Mexico, we could see the beginnings of a beautiful sunset. As I seem to collect sunset photos we pulled off on a side road to watch and photograph this one and found we were not alone. Jayson and his dog Dakota--from Ohio--were taking a sunset break from their daily 20-mile trek. 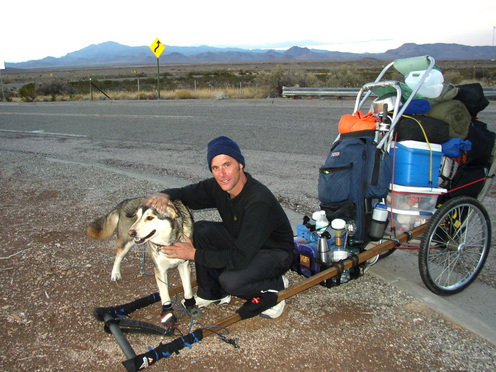 They are eight months out on a planned three year walk from Dallas to Oregon. We talked and enjoyed the sunset until we felt guilty that he would now have to walk seven miles in the dark to his planned camping site. Two days later we were driving along the Rio Grande in Ralph Edwards park and saw them again, re-packing the rickshaw to continue on their way. He's keeping journals of his trip and the people he meets. I hope he turns them into a book, a sort of Blue Highways by rickshaw. If he does I'll definitely read it. I've been away from the blog for five weeks, four of them traveling and one because my DSL modem was acting up and I couldn't get online. I've downloaded many photos of beautiful places and wonderful experiences in Chile and will include quite a few of them here--eventually. It's good to be back though I'm beginning to fret over Christmas preparations. 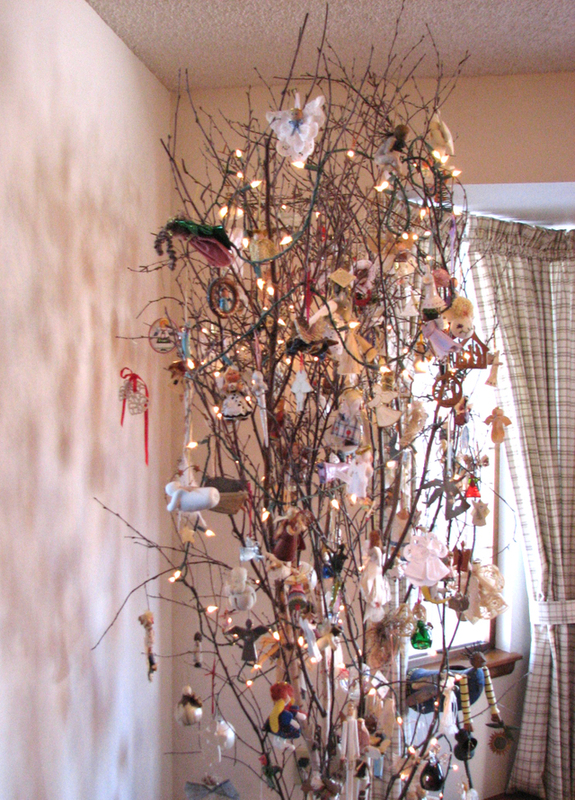 We'll put up our tree tomorrow and that will probably push us headlong into the seasonal hubbub. This cat was a stow-away on a ship bound for Hawaii. In 1966 when I was a second-year teacher of 12th grade English, the Advanced Art class met just after my class and, to save a trip to their lockers, some of my students brought their art work with them. I commented on how much I liked this one, which was a young girl's final project. On the last day of classes she came back by as I was packing up and offered it to me as a gift. I insisted on paying her and she said, "Okay, I'll take $12 for it." She had not signed the painting because of its waxy surface but had stapled a card to the back which had her name on it. She told me in detail how she had grated crayons on a cheese grater, then held each color in a tablespoon over a candle until it was liquid and dribbled the colors to create this cat. 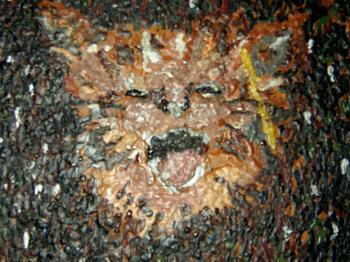 I love cats and have always loved this particular piece of art. When in 1976 our family was moved by Western Airlines to Honolulu for 3 years, we took this cat with us. The movers came, wrapped and packed everything carefully including this piece. It took two weeks for the furniture to make the ocean journey in a Matson container. Everything arrived in wonderful shape. I picked up and examined the package containing the cat: not even a dent or tear in the paper. However, when I opened it I realized that the cat had made the journey face-down as all the wax dribblings were hanging downward like two-inch stalagtites, yet the shape was still distinguishable and the colors had not run together. My husband and I carefully warmed each wax appendage--with a candle and a hairdryer--and gently tucked the softened strands back into position. I'm sure it was changed slightly from the young artist's conception but it is all the more prescious because of its adventurous journey. Not wanting a repeat of the problem, I hand-carried it on its return trip. Only when packaging the piece for its airplane ride did I notice that something else had happened during the ocean journey--the artist's name had been lost. It had been so long that I no longer remembered the name nor had any record of it. So, somewhere there lives a woman from Grand Forks North Dakota's High School class of "66" whose art has brought me much joy--and a little panic--and I can't even give her attribution for her effort. Yesterday we attended our first Batizado (literally translated as baptism). Capoeira Masters and their groups of students came to Denver from all over the US to demonstrate their skills in hopes of receiving a "cordao" (woven belt) to indicate the next level of achievement. Masters flew in from ten states and several countries--including Brazil, of course-- to test and instruct each candidate. But first, each Master played another Master to give credibility to their skills and to set the standard that candidates must achieve. As this is a dance, although it uses martial arts moves, there is no competition. The word "play" is purposely used to describe the interaction between the two dancers performing within the circle. The dance involves advancement and avoidance moves, cartwheels,handstands, kicks and defensive techniques. There is--if done correctly--no physical contact. Yet, I have no doubt that these candidates possess the skill and strength for self-defense if necessary. 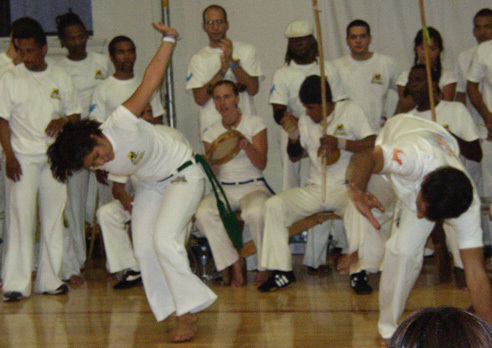 The Maculele, in the photo above, is not a part of capoeira but is a common Brazilian celebration presented in honor of acheivement--and all the dancers in this case were capoeiristas. Each candidate received two family tickets and as Ligia's host family we were privileged to attend. Though the energy was highly charged with rhytmic instruments, clapping and song, the dedication and quiet respect for their craft was almost spiritual. 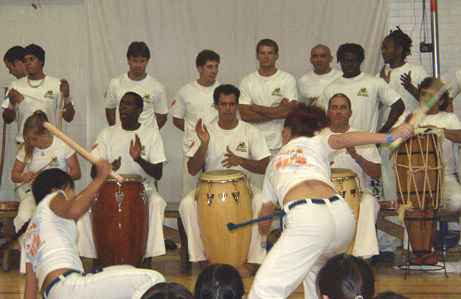 If you wish to see--and hear--more, there is a link on my March 26 entry: Capoeira. When I look at these eggs, I am reminded of one of the many "loveable eccentrics" that I have encountered on my life journey--actually he may have been the first person I recognized as such. Eccentrics are some of my favorite people. They whistle a different tune and dance to a different drummer. I appreciate that. I just wouldn't live with, depend upon or share a checking account with some of them. I first met Boris just after I married my Air Force KC-135 pilot husband. Boris was a Navigator on the same plane and he and Bob were members of the 905th Air Refueling Squadron located on the S.A.C base at Grand Forks, North Dakota. Both had joined the Air Force "to see the world" and both had been assigned to a base less than 150 miles from their North Dakota home towns. In those days--the Vietnam Era--navigators filled the niche that sophisticated GPS technology fills today. One of Boris's jocular responses when asked why he had called for a change in course was that he was flying them around the mustard he spilled on the flight plan. My first encounter with Boris was several weeks after we'd moved into on-base housing. Boris was hosting some of his squadron mates and their wives or dates for Ukranian food at the home he shared with 3 other bachelors. We walked in to find a tall lanky man, with an infectious grin, stirring a huge pot of borscht on the stove--while matching vodka shots with each newly arrived guest. Boris was a first generation USA-born Ukranian whose parents farmed a small acreage in Western North Dakota. He was a study in contrasts: highly ambitious and animated but extremely reserved about sharing his personal life. He enlisted in the Air Force right out of high school then, while still a Private, applied for Officer Candidate's School and was accepted. He became a navigator, served in that capacity for several years then applied for pilot training. He did well enough that he was selected as a fighter pilot and flew some of the most dangerous missions in Vietnam. He retired from the Air Force at age 40, having finished his career as a flight instructor training foreign military pilots on the F-5 fighter plane. After retirement he returned to the family farm where he cared for his aging mother and a motley collection of animals. He became a virtual recluse, leaving the farm only to go hunting each fall and to take the occasional road trip. 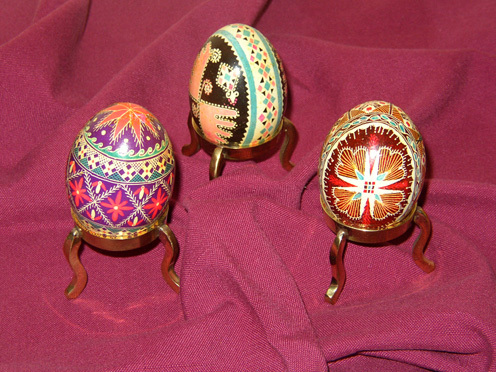 On one such trip he visited us in our home three months after the birth of our first son and came bearing a celebratory gift: three intricately-decorated Ukranian eggs, sealed--not blown (an important distinction to him). Their beautifully-preserved vibrant colors always spark memories of a unique friend. Last March Boris called as he did about once each year. Bob was gone, but Boris talked to me for over an hour, reminiscing about the old days. When I had asked how things were going with him, he cryptically answered, "Better" but would not elaborate. We found out two months ago--when Bob joined an email list for the 905th A.R.S. that Boris had died last December, alone in his house, of cancer. In memory of a "much-beloved eccentric" and his Ukranian eggs. 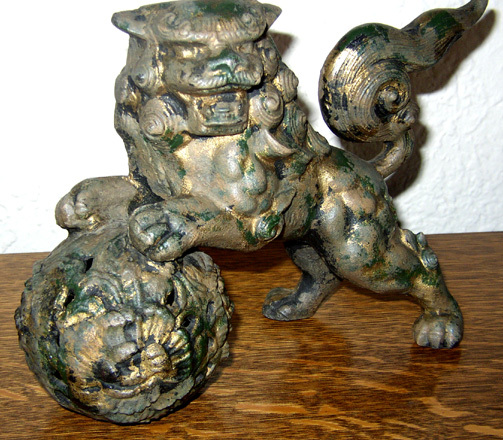 We never meant to tarnish the reputation of ancient Chinese figures used as symbols for protection of truth and defence against evil. It was our joint admiration for these dramatic figures, whose acquaintance we made while living in Hawaii in the late 70's, that inspired my husband to purchase a Fu Dog for me as a Christmas gift the year after we returned to life "on the mainland." Totally ignorant of long-standing "Fu etiquette," we now possess a flawed dog, a faulty lion--a "Lone Fu." Only a real friend will tell you the brutal truth so it fell to our dear friend Annie from Hong Kong to tell us that Fu dogs must always be owned as a pair: a male with his foot firmly placed on a world globe and a female in a similar pose but with her foot placed on an upside-down pup or cub--depending on whether one calls it a Fu Dog or a Temple Lion. I am sorry that somewhere out there stands a Fu female without her molded mate but I am shameless; I adore my mateless Fu male. I only hope the Feng Shui gods can forgive us. 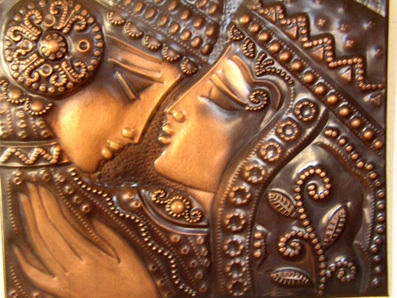 This copper etching hangs on my dining room wall. Each time I pass it I think of the Ivanishvili family from Tablisi Georgia. I met the daughter Nina in 1991. She had been attending the University of Denver on a student visa and had entered the country on a passport issued by the U.S.S.R. When the Soviet Union collapsed in 1991, she found herself with no way to renew her Visa for the coming school year as the government that had issued the passport no longer existed. Her home country Georgia--once a republic of USSR--was now newly independent without the necessary bureaucracy to issue her a passport. With the help of her university advisors and immigration officials, she obtained refugee status. 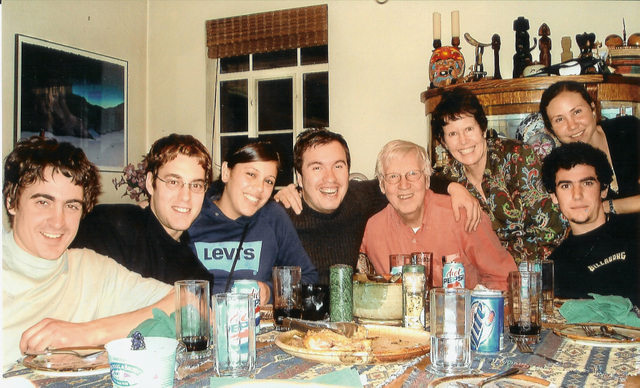 Within weeks her home country was in turmoil and with only a short notice, her father, mother and 88-year-old grandmother walked out of their home--with one bag each--to join Nina and a new life in Denver. My mother, who parented us by aphorism, often said, "It is more blessed to give than to receive." As a child, being blessed was not important to me--and receiving gifts was certainly more fun. As an adult being blessed is still not that important to me though I've discovered that giving is definitely much easier than acceptance. When gifts are given from excess, abundance or plenty the acceptance, though often accompanied by a sense of obligation, is relatively easy. It is when the gift is a true financial and sentimental sacrifice that it is much more difficult. Over the years I have realized that sincere, appreciative acceptance is in itself a gift. It has probably become obvious that I am, in this blog, using gifts I've received--from the many people who've paraded through our house over the years--as writing prompts to capture their stories. I never walk past my glass-doored "gift" case or dust one of the objects sitting around my house that a name and a story doesn't pop into my head. 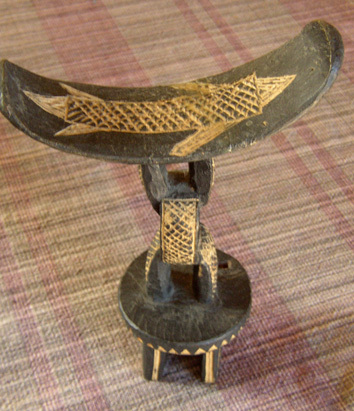 Today's symbol is a Somalian nomad pillow and the story is Hussein's. Hussein was born into a nomadic family in the Somalian desert. When he was eight years old his father was killed in an accident and the tribal custom was to send any male children to live with brothers of the father. Hussein was sent to Mogadisho to live with his uncle who educated him through the university. Hussein became a social worker and was sent back to the nomads in 1979 to teach them the written form of the Somalian language--which was only established in 1973. Since the nomads traveled through the desert, all their possessions had to be light weight and easily carried by hand or on the back of a camel. According to a tribal custom the young men did not cut their hair until they were married. This "pillow" served one main purpose--to keep the their "Fro's" out of the dessert sand while they slept. The pillow, made of a light balsa-type wood, is more comfortable than one would think when the curved upper portion is placed at the back or side of the neck. 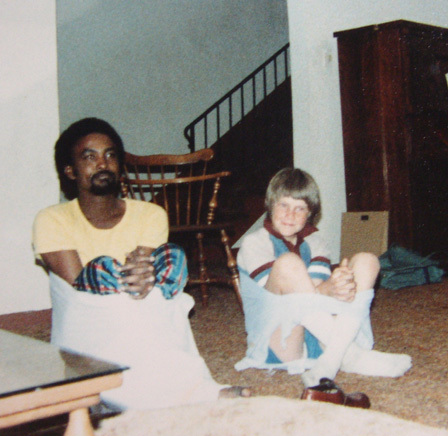 This photo shows one of our sons with Hussein after he had demonstrated how Somalian nomads used large pieces of cloth--in this case, bedsheets--to make chairs. This was only one of many lessons taught by this compassionate man with the delightful sense of humor. In 1985, one of Hussein's friends wrote to tell us that Hussein had been among the many bystanders killed by an explosion in Ethiopia, where he was working assisting refugees.